exist. No portion of this material may be reproduced, in any form or by any means, without permission in writing from the publisher. 6–2. Draw the shear and moment diagrams for the shaft. shaft. The loading is applied to the pulleys at B and C and E.
6–5. Draw the shear and moment diagrams for the beam. Support Reactions: As shown on FBD. functions of x, where 4 ft < x < 10 ft.
moment diagrams for the shaft. Shear and Moment Diagram: As shown in Figs. b and c.
and determine the shear and moment as functions of x.
M = 4 kip # ft.
compressive bending stresses in the part. 6–61. The beam is subjected to a moment of 15 kip # ft.
the web D of the beam. 6–69. 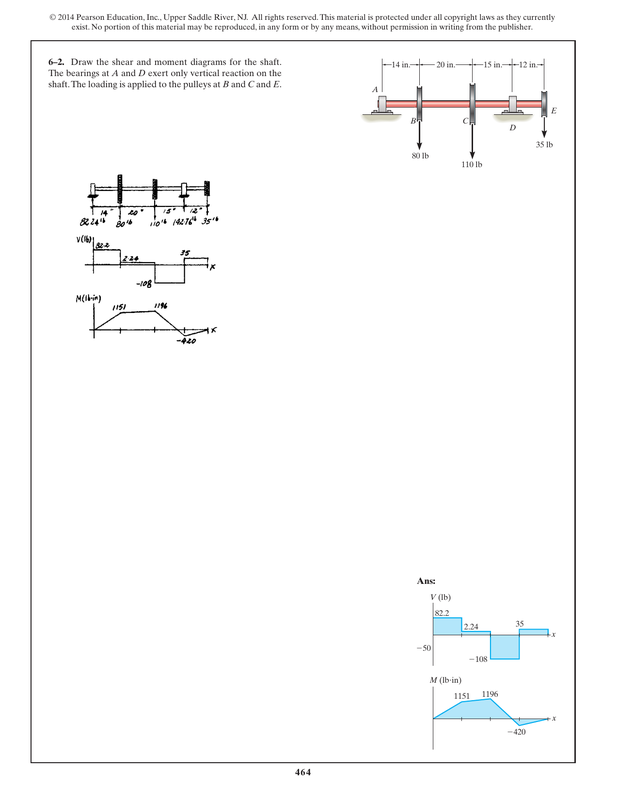 Two designs for a beam are to be considered. M = 150 kN # m with the least amount of bending stress. dimensions shown and pinned at C.
width of the beam is b = 8 in.